[Movie] buzz of the week!! While living in New York City, he turns 40. 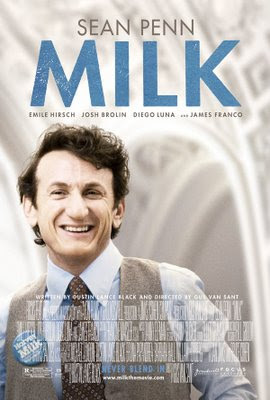 Looking for more purpose, Milk and his lover Scott Smith (James Franco) relocate to San Francisco, where they start the small business --- Castro Camera,much to the chagrin of neighbors!!. Over time, with support from Scott and from new friends like young activist Cleve Jones (Emile Hirsch), Milk plunges headfirst into the choppy waters of politics. When Milk is elected supervisor for the newly zoned District 5, he tries to coordinate his efforts with those of another newly elected supervisor, Dan White (Josh Brolin). 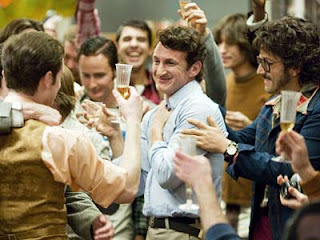 But as White and Milk’s political agendas differ, the movie takes quite a turn... A movie about the life of Gay people back in the 70s to how Politics was always ruling the roost is what sets this movie apart from others!!! This is a hard-hitting thriller, great execution of the script by the director and performances that make an impact on the viewer. The movie is just 1:30 hours and had me glued to the sofa the entire duration!!! 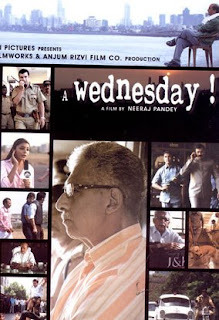 The story takes place on a wednesday between 2 and 6 pm. 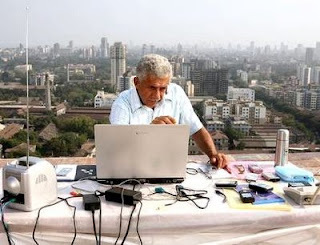 Prakash Rathod (Anupam Kher) a police commissioner gets a call from a man (Naseeruddin Shah), saying that 5 bombs are going to explode in Mumbai in 2 hours and the police needs to do as he says[ following which he will reveal the location of the bombs]. First task for the police force is to release 4 militants. Anupam Kher, Jimmy Shergill and Aamir Bashir have done a good job in executing their roles to the T.
What will he do now in the short time period that he has been given? Will he release the militants or just work towards finding "The man"... Watch this movie, if you havent already!!! After all the hype and the Golden Globes, i finally managed to watch the movie- Slumdog Millionaire !! I had read the book "Q & A by Vikas Swarup" about 2yrs back, and vaguely remembered the story.. That was when KBC was this very popular and happening show on TV...!! This movie opens the police inspector (Irrfan Khan) interrogating and torturing Jamal Malik (Dev Patel) who's from the Dharavi slums on how he managed to answer correctly on 99% of the questions on the Who Wants to Be a Millionaire? (Kaun Banega Crorepati), hosted by Prem Kumar (noted Bollywood actor Anil Kapoor). They want to know if he was cheating? This is where Jamal starts off offering an explanation for each of the questions, relating them to his childhood days till today. This includes scenes of him obtaining the autograph of Bollywood superstar Amitabh Bachchan; the death of his mother during Hindu-Muslim riots in the slums; and how he and his brother Salim (Madhur Mittal) get friendly with this orphan girl, Latika (Freida Pinto). With every question, we are taken into the lives of this young man,and the turmoils he has gone through to reach where he has now.. At one point brothers loose track of Latika, only to later rescue her from forced prostitution. The would-be lovers are again pulled apart when Salim, who has turned to a life of crime, forces her to become a part of his crime lord’s harem. Jamal’s impetus for being on the game show, and his motivation to continue his focus, and he is on it not for the money,but in hope that his Latika will see him and they can reunite. I dont want to write in detail about the various aspects of the movie, but one must watch it to understand the depth!! Music by A R Rehman needs no special mention, what with all the Awards he has snatched already!! Latika’s Theme, in essence, is the instrumental of the very soulful “Dreams On Fire.” However, Rahman realizes that the beauty of the original song lies within the melodic power and vocal gentleness. Set in 1928, "Changeling" is a about Christine Colins (Angelina Jolie) who loses her son, who was home alone while she went to work and her battle with the Los Angeles Police Dept. Christine gets upset to discover that Walter was nowhere to be found and no sight of him across the neighborhood. From there on, she works tirelessly looking for him, and trying to get the Cops to help find him. When all hope seems to be lost, she gets a visit from the LAPD and she comes face to face with a nine-year-old boy claiming to be her son. Inspite of her refusal, the kid states all details related to her son and the cops convince her he is her son!!! What was most disturbing about this movie is that the stark reality of what actually happened to about 20 kids who went missing, the teenager who reveals scary truths along with the Cop-Lester Ybarra [Michael Kelly] who is responsible in working on this case,but who is shunned by the Inspector. With boundless love and affection, his life is filled with fresh joy; his day starts and ends with his Abhi. He takes care of everything and ensures Abhi leads a happy life devoid of any worries. As days go by, the girl grows up. The way he comes to terms with her heading off to school on her own, making decisions regarding college with confidence is beautifully depicted... Esp when Abhi (Trisha) decides to pursue higher studies in Delhi, how he tries to convince her otherwise.... Eventually, she persuades him to accept her plans. The dad starts finding ways to distance himself from the girl, alas failing.. all because he loves her too much... The first half of the movie is absolutely wonderful, brilliantly made.... but the 2nd half is where it falters.. yes, the story line is good, and all that, but the songs, scenes towards latter half seem so unnecessary... We almost lose the momentum.. I wonder when Tamil movies will break away from this song and dance mould and start focussing on the story alone!! !